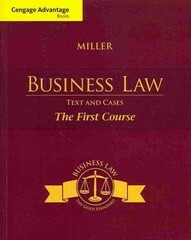 Cengage Advantage Books: Business Law 1 Edition Based on the first half of the longtime market-leader BUSINESS LAW: TEXT AND CASES by Clarkson/Miller/Cross, this paperback text offers an affordable solution for the first course in a business law series, often a requirement for business majors. It delivers an ideal blend of classic "black letter law" and contemporary cases. The text's strong student orientation makes the law accessible, interesting, and relevant, with cases that represent the latest developments.